I've always had a great interest in exploits and hacking the game (among other things), just for the sheer challenge and creativity about it, so I thought I would share what I know about exploits in Vanilla. Please note that during Vanilla I raided in a guild called Windwalkers (I think we killed Kel'thuzad as about #20) so none of these exploits can be directly attributed to other top guilds, world firsts, or our guild for that matter. The point of this article is not to put blame on anyone anyway – in the end they are all bugs, which shouldn't have been in the game in the first place. Aside from all the bugs listed here, it was also common to have a few out-of-combat rezzers who made sure never to heal or damage the boss and stayed outside the raid constantly resurrecting players who died. I'm not sure when Blizzard changed it so you're put in combat when you resurrect someone, but I think I remember doing this even in Ahn'Qiraj. Onyxia is one of the bosses that have had the most rumours circulating around her, and after every patch there was always a discussion about whether she breathes fire on the raid more often or about her weird habits of not staying on the tank. The later can largely be attributed to the fact that at the time there weren't any addons to monitor threat, and aggro resets were generally not really much known about. Several guilds, including mine, forced all casters to just wand the first 20%, which was essentially a magic strategy that most people didn't know the reason for but that just seemed to work. But like on almost every boss, there were people that found ways to make the encounter significantly easier. During the third phase on Onyxia, she would often cast a fear on the entire raid (which meant Alliance fear-warded the tank) after which fire would splash up through cracks in the floor. 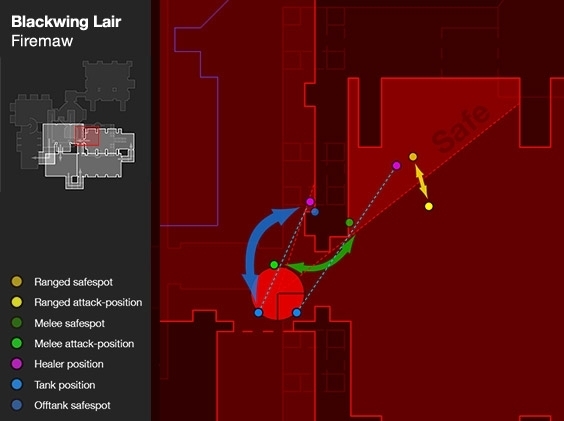 Through wall-jumping or simply running up at a few selected spots on the wall, you were able to get up to an area where no fire would splash and the whole raid took significantly less damage. It was possible to skip several packs of trash and wall-walk directly to Gehennas. A guild was allegedly permanently banned for doing this, which caused a lot of concern in top guilds at the time and years after about whether skipping trash is ok or not, something that had almost become a standard in the later years. Although I never attempted this myself, it was possible to tank Magmadar inside the wall and melee him to death, thereby circumventing all of the real mechanics of the fight. Although never announced as an exploit by Blizzard, aside from conflicting reports by Game Masters, you were able to mindcontrol a Scarshield Spellbinder in Blackrock Spire to gain 75 fire resistance on the entire raid for one hour. This helped significantly not only on Ragnaros, but on every boss that did fire damage. The spell was nerfed sometime in 2007 so it didn't impact any world firsts after that. I've personally used this for several first kills in guilds I've played in, and it was commonly used by guilds who thought it was worth the trouble to be able to get those first kills. I would argue that it was almost more common than not to do this, which opens up an interesting argument about Ensidia's mindcontrolling of adds on Hodir for a buff many years later (guess who coined the term Flower Power btw?!). During the fight one person in the raid would normally mind-control Razorgore and proceed to kill eggs in the room while the rest of the raid would kill and kite adds that would spawn in corners of the room to rush towards eggs in the room and Razorgore and try to kill him. The objective of the fight was to deal with the adds until all eggs were destroyed, and then proceed to kill Razorgore. It was quite a challenging fight at the time and required an unforeseen amount of coordination and strategy to pull of if you didn't have enough dps to just blast through the adds. However it took some time before Blizzard added a gate at the entrance of the instance that would close when the fight was engaged, and prior to this it was possible to simply corpse-run back if you died and join in. Another bug that only existed for alliance (due to the lack of paladins horde-side) was the possibility to cast Divine Intervention on Razorgore when he was mind-controlled. The rest of the raid would try to die as fast as possible, with one healer having been soulstoned beforehand. All the adds would despawn and not spawn again, the healer would res up, res everyone else in the room and then aggro and kill Razorgore. Clever? Yes. Exploit? Definitely. Note that not even Tigole could correctly spell the name of this boss. This was the first incarnation of limited attempts by Blizzard, and it was - no surprise here - hated by close to everyone, which meant people got creative. Not only did the UBRS fire-resistance buff help here, but there was a clever mind-vision exploit that could be used. During the fight Vaelastrasz would cast a buff called Burning Adrenaline on a random player in the raid, which would make all of his or her attacks become instant. The problem here is that said player would also lose 5% max-health every second until death, and then proceed to explode, killing any players nearby (which was really funny if you ported to the auction house). Now while this buff was great to have, it still meant that players eventually died, and when tanks got buffed it required a change of tanks which could be tricky, with aggro management and all that. It didn't help that more often than not Vael would tail-swipe the raid during the transition. Normally you would have 5 tanks or so building aggro simultaneously and in a time of no aggro monitoring addons this meant that one tank starts 10s before the next one and so on (as you might guess, this didn't always work) while the raid idles by. Some very clever people realised that there was a way to get rid of Burning Adrenaline from the tanks by exploiting the buff/debuff limit (I believe it was around 16) by having several priests casting Mind Vision on the tank simultaneously and thereby pushing off the Burning Adrenaline. This made the fight a lot easier and allowed raids to start damage much earlier and took away the hard part of tank switching. Here's one of the first videos I ever made, so please take time and appreciate the incredible UI and mouse clicking going on. Shadowpriests were really rare in those days, and when we eventually rerolled on another server I was asked to switch to a warlock for less loot drama – priests should be healing and all that. 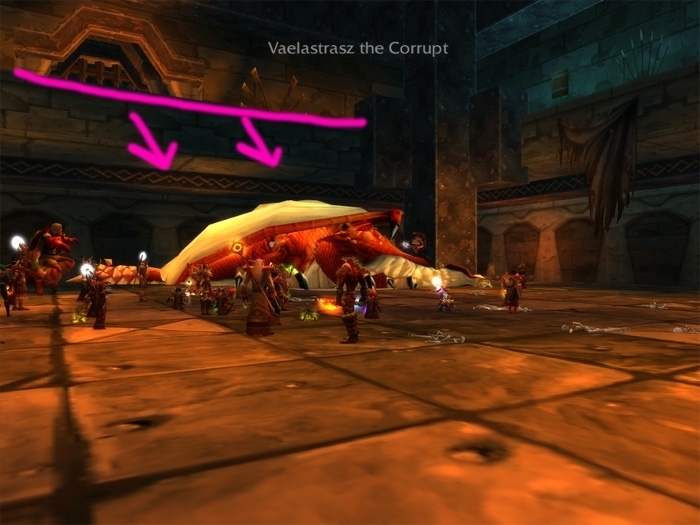 Like most other later bosses in the instance, it was possible to kite Broodlord to Vaelastrasz's room (which created the wow-meme of "kite it to vael's room") where the room was structured so that the raid could stand on an upper floor and dps down to the bottom floor. When someone pulled aggro, which was the one real challenge in the fight, he would just start slowly running to the top floor, and once he reached the top floor, said player could simply jump down, and laugh while Broodlord was running all the way back. Another benefit for doing this was that you normally fought Brood Lord while standing inside a room with quickly re-spawning adds (getting to him was actually the hardest part), so fighting in a safer place made it significantly easier. A common element in Blackwing Lair and a new mechanic at the time was spells that only affected you if you were in line of sight of the boss. To combat this players would normally place healers so they were in line of sight of the tank, but not of the boss. Sadly this didn't work flawlessly and for both fights there were spots where you could stand and dps and heal while still being out of sight of the boss. For example the second floor in Vael's room, or the ramp just before Chromaggus. Speaking of Chromaggus I have to commend whoever designed that fight because it was one of the more tactically interesting and challenging fights at the time. Another exploit that was effectively true on every boss, is that it was possible to have a raid with more than 40 people, and have people who died log off and then have someone else log into the game and directly join in to the fight. I only know of it being used on Nerfarian though. Something else that isn't entirely an exploit but that could be extremely useful was to farm Startholme Holy Water which you then used on the adds that spawned during the fight. If you had around 10 people with it, the adds would die almost instantly and negate what many considered to be the most stressful part. It's almost impossible to cover all the exploits in this instance but the most common were the ones used on Hakkar. At even intervals, and thereby timable with my little stopwatch (yes seriously) Hakkar would cast a Blood Funnel that sucked the blood of all players. The common strategy was to get a debuff from killing some serpents, which then poisoned Hakkar when he sucked the blood so that he was effectively killing himself. Or you could simply not bother with it and just kill the boss. What not many people knew about but what I discovered was that if you were moving while he was casting Blood Funnel, it would not affect you. So you could just have the whole raid running around like headless chicken a few seconds before he cast it (timed by my stopwatch!) and not bother with adds nor healing Hakkar. Another nice bug with Hakkar was Corrupted Blood which was sort of a spreading disease. If a player got the debuff and then ported to town, he could spread it to nearly everyone and watch them die. I believe this was covered by some of the bigger news-sites and spawned a lot of interest in wether WoW could be used to study human behaviour in case of a real epidemic. Lethon would spawn sleeping clouds that would move around in the raid putting players to sleep but you could avoid this by standing on top of structures where the sleep wouldn't spread, such as the ramps which were often nearby. An exploit involving Reckoning allowed paladins to build up infinite stacks and then be able to one-shot any boss. Kazzak is the most famous because of the video that was released by the guy who found out about it. I believe he was banned shortly afterwards. Azuregos would at regular intervals teleport all players on top of him and reset the aggro of everyone and breathe a heavy damage attack shortly afterwards. If the tank failed to pick him up properly, it could be a fast wipe. This could, however, be prevented by allowing a soul-linked Void Walker to tank him, because the Void Walker wasn't affected by the teleport, and could build higher and higher aggro. Something else that was common on Azuregos (and other fights) was to have two healing teams to manage the use of mana. Team 1 would heal until they were oom, and then proceed to run away from the boss until they were out of combat, while Team 2 would take over. Team 1 would then sit down and drink themselves full, to join in later when Team 2 needed a drinking break. Huhuran would often cast a big poison aoe aura that damaged the entire raid and stacked. Normally you would stack a lot of Nature Resistance gear to give you a chance to fully resist this aura, but some clever folks realised that it could be used in their favour. By using marks collected in Zul'gurub, you could buy Sheen of Zanza at a small island outside Strangethorn Vale. These days, this buff is effectively worthless but back in the day it used to have a much higher % of reflection. Now, if it reflected you took 0% damage and Huhuran took 100%. Now you can imagine what kind of damage Huruan had to suffer when she had 99x stacks of this ticking on her. She died in a matter of seconds. Another thing you could do was have shamans spamming grounding totems and preventing the raid from taking nearly any damage. To this day I still don't know if this actually worked or not, and there has been a lot of drama about whether this is something that Nihilum used. I've played with several members of Nihilum who were on the kill, and they've all laughed at the notion and weren't even aware of that this was possible. I personally believe them as they really had no reason to lie after all this time. Anyway. Supposedly it was possible to farm a Disgusting Oozeling in Eastern Plaguelands (trust me, by no means an easy task, I think I spent a week doing this non-stop until I got it), and then using it in the fight. The oozeling, when active, gives you a debuff that reduces your resistances, but if put inside a macro and spammed you could fill up your own debuffs to the point of pushing off any other debuffs on you, similar to the Mind Vision exploit on Vael (this would probably have worked there too). When fighting C'thun, he would put random players inside his stomach and apply a stacking debuff called Digestive Acid that would slowly kill you if you didn't exit his stomach by jumping on a little platform. Using the oozeling, players were supposedly able to push off this debuff and stay inside forever, damaging the tentacle that when killed made C'thun highly vulnerable to damage. Whoever got ported inside the stomach was completely random, and I find it extremely hard to believe that Nihilum would have several people in the raid farm a stupid pet just for this possibility, or that they really came up with an idea like that. What's more likely is that they just killed the boss because of the nerf that happened that night, while the US guilds were sleeping. It's really easy to always want to believe the worst of everyone just because it's more dramatic, but in this case I personally would clear Nihilum from any suggestions of exploiting. A guild who had quite a high ranking at the time called Overrated came up with the very stupid idea of modifying game files using something called the Patch-3 exploit. 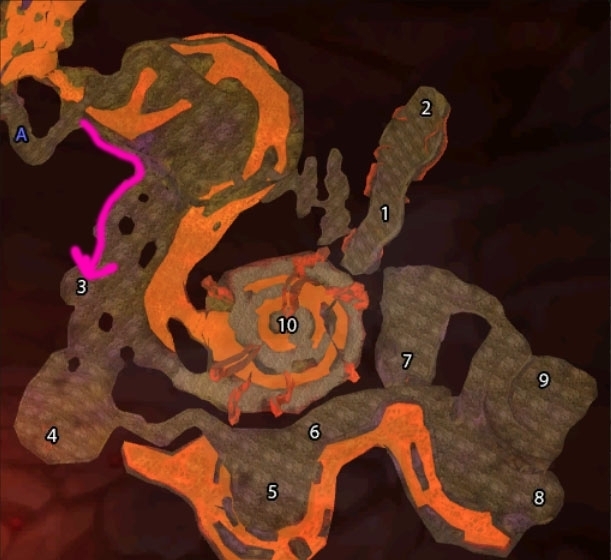 The same exploit was actually used to allow players to play with the model of other races, but what Overrated did was to turn the stairs at the entrance of the instance into a chicken (or some other small model) thereby skipping the whole rest of the instance including trash and walking directly to C'thun. This was awarded by Blizzard with a permanent ban for the entire guild. Well deserved, I might add. Although not really an exploit, a lot of frostmages made fortunes kite-farming the trash in Naxxramas for the BOE epics that could drop, which were extremely good and highly desired by top raiders. As with every line of sight boss before, it was possible to be in a position where you could avoid getting damage by his shout and still be able to deal damage. While this isn't a really big exploit, it still did allow you to do more damage to him faster. You could have all the adds in the room evade by wall jumping, and still kill Gothik. In a similar fashion as the Broodlord exploit, it was possible for hunters to kite Patchwerk to the first Spider Wing room and kite him there forever without him being able to hit anyone. Hilarious and big props to the guys that came up with it! On Heigan there was a spot where you could stand still the entire time and never have to do the "dance". Why you would want to do that is beyond me because the fight was easy and very enjoyable! 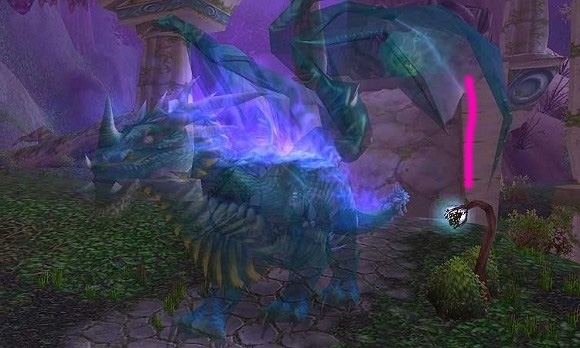 Loatheb was one of the harder bosses in the instance, as it required a raid of 40 people to do everything right and follow a planed rotation of healing and consumable use. Every time you healed, an at least minute long cooldown was applied until you could cast your next heal. Trust me, when you have a 40man guild there's bound to be a ton of idiots who weren't able to follow instructions or keep up a healing rotation. After Death & Taxes killed him, they came up with a clever scheme of using a team of shadowpriests with one tank, healing him with only Vampiric Embrace and staying alive forever. This ends the first part of the series, and I'd be very thankful for any help collecting more for the next part about The Burning Crusade. I'm also fully aware that there must have been many more bugs in Vanilla that I simply didn't know about, so please share those in the comments. I would also like to end with saying that every game has bugs, but few games have been so methodically eyed at the seams as WoW has. This is probably why this list is as long as it is.